This exhibition marks the 50th anniversary of Flanagan’s first solo show, held at Rowan Gallery, London, in 1966; when the US art critic Gene Baro penned the review ‘animal, vegetable, mineral’. The exhibition at Waddington Custot Galleries focuses on Barry Flanagan’s early career and presents a survey of works from the 1960s, 70s and 80s. It is the first held by the gallery after Leslie Waddington died. Celebrating the collaboration between Waddington and Flanagan was a central component to devising the exhibition and to do this by drawing attention to the work that attracted Waddington to Flanagan was a natural way to focus attention on Flanagan’s early engagement with materials. It includes a selection of Flanagan’s key early explorations in material and form instrumental in shaping his later career. Some works have not been exhibited for over 30 years. 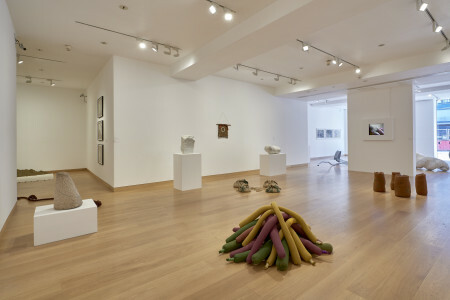 The artist’s use of unconventional materials and his central position in early British Conceptual Art is further informed by displays of contemporary material from the Estate archive, including examples of the artist’s concrete poetry, working drawings, logbooks and photographs. Animal, Vegetable, Mineral reveals the variety of mediums Flanagan experimented with, natural and manmade, including sand, plaster, cloth, metal, stone and bronze. His questioning, sometimes irreverent approach to the creation of his sculptures challenged the nature of these materials, in particular how they could be affected by forces such as heat or gravity, allowing them to arrive naturally at their final form. The sand in untitled 1970 and four rahsb 2 ’67 (1967) is contained within pre-sewn canvas bags allowing the sculptures to find their own shape. one ton corner piece ’67 (1967), created by pouring a prescribed weight of sand on to the floor of the gallery, reveals Flanagan’s preoccupation with subverting conventional installations in gallery environments. Crossing media, he used photography and film in his practice; sand girl (1971) observes the contours and mounds of sand poured across the body of a naked woman; the viewer watches sculpting in action.